Free Scenarios Sixteen Through Twenty! We continue our list of the thirty most desired 18th and 19th century battles (as voted on by you) with numbers sixteen through twenty. All thirty scenarios will ship with General Staff, as well as the Army Editor, the Map Editor and the Scenario Editor to early supporters of General Staff on Kickstarter. After Kickstarter these scenarios, and the software editing suite, will be available as digital downloads (DDL). 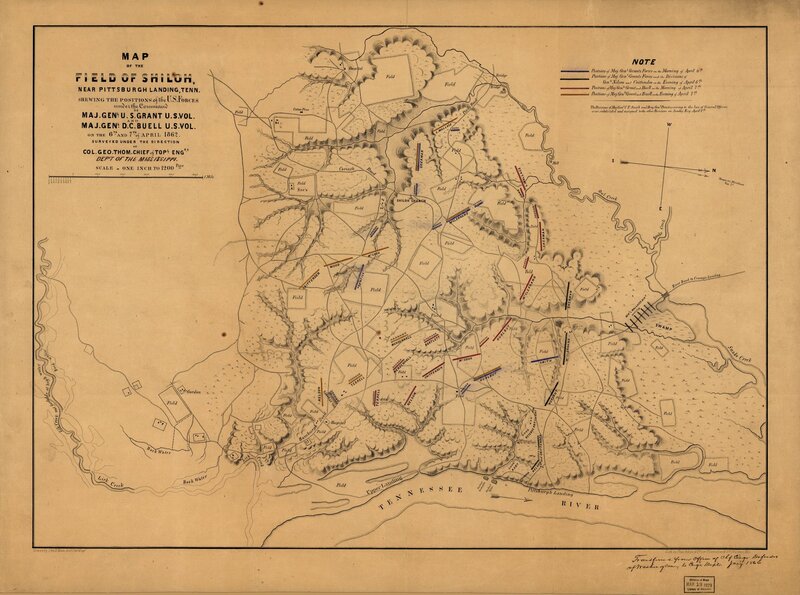 The battle of Shiloh created for the Topographical Engineers in 1866. From the Library of Congress. This is a great image. Please click to greatly enlarge. If you have ever visited the site of the battle of Shiloh (Pittsburg Landing, Tennessee) your first thoughts were probably, “how could two large armies fight in this forest?” There are, of course, clearings where significant events took place and where the Union encampments were attacked, but Shiloh is mostly deep forest cut with ravines and a few paths and roads. Shiloh was also a two-day battle with the first day ending as a major Confederate victory and the second a Union triumph. Grant’s Army of the Tennessee was bivouacked alongside the Tennessee River after its victories at Forts Donelson and Henry. Union commanders, including Sherman, ignored reports of Confederate activity in the vicinity. When the Confederates attacked on April 6 the Union forces were overwhelmed. Plaque on the Shiloh battlefield indicating the location of Grant’s HQ. Click to enlarge. On the evening of April 6-7, 1862 a terrific thunderstorm fell across the battlefield. 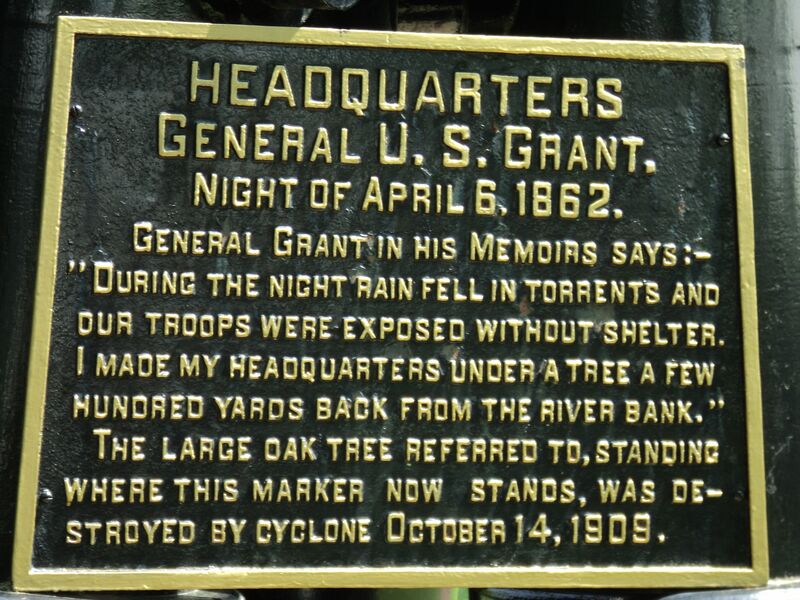 Grant’s headquarters had been taken over as a field hospital and so he retreated to a tree where he stood in the rain holding a lantern in one hand and smoking a cigar. 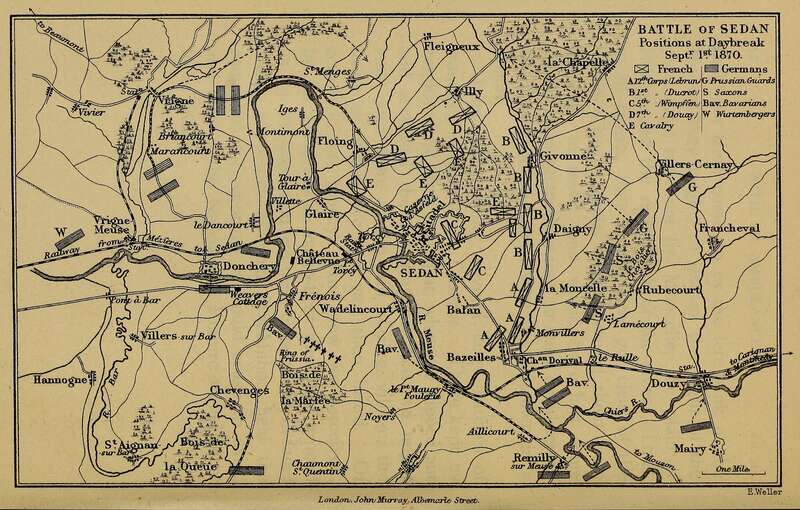 Grant’s subordinate commanders had decided that the battle was lost and that the army’s only hope was to abandon the artillery and baggage and ferry the troops across the river. Nobody wanted to approach Grant and, eventually, Sherman was induced to talk to him. He found Grant under this famous tree. The Confederates ordered an attack against Grant’s troops at dawn. Grant ordered an attack on the Confederates an hour before dawn. The rest is history. 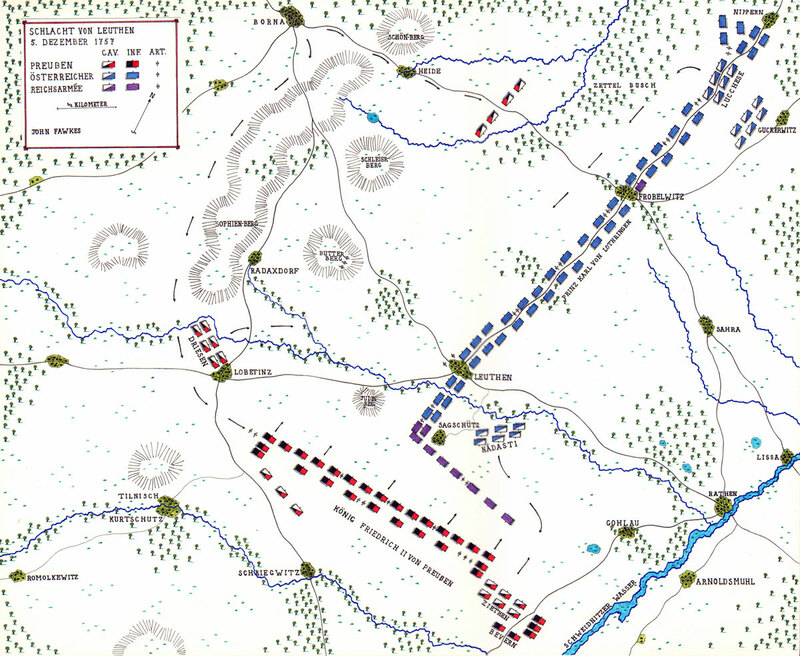 Positions in the morning of Day 2 of the battle of Eylau. Click to enlarge. Though Eylau is listed as one of Napoleon’s great victories on the Arc de Triomphe, in reality it was a massacre in a blizzard that ended in a slight French tactical victory and a minor Russian strategic success. 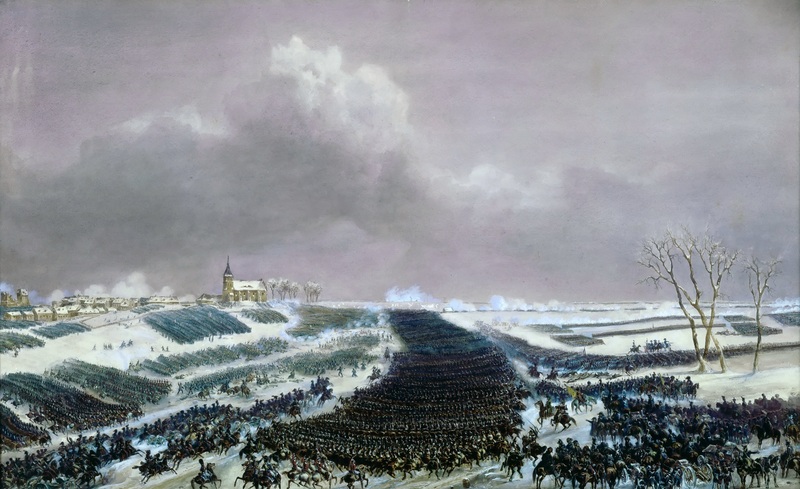 Two large armies (the French and the Russian / Prussian armies were approximately the same size at 75,000 troops) occupied parallel ridge lines separated by a valley. It was February in Poland and the weather was freezing and snowy. Obviously, the weather conditions greatly effected troop speeds. It is very easy in General Staff to adjust unit speeds to reflect various weather conditions (see here). At a critical juncture Napoleon ordered Murat to charge the Russian center with his 11,000 strong force. Though this was one of the largest cavalry charges of all times, this dubious honor actually belongs to the Polish and German cavalry at the battle of Vienna September 12, 1683 with an estimated force of 20,000. Murat’s famous cavalry charge at Eylau painted by Jean-Antoine-Siméon Fort. Click to enlarge. Murat’s charge stabilized Napoleon’s center and the Russian and Prussian troops withdrew from the battlefield that night. The French were too exhausted to pursue. After the battle, the late arriving Marshal Ney famously observed: “Quel massacre! Et sans résultat” (“What a massacre! And without result”). The battle of Leuthen. 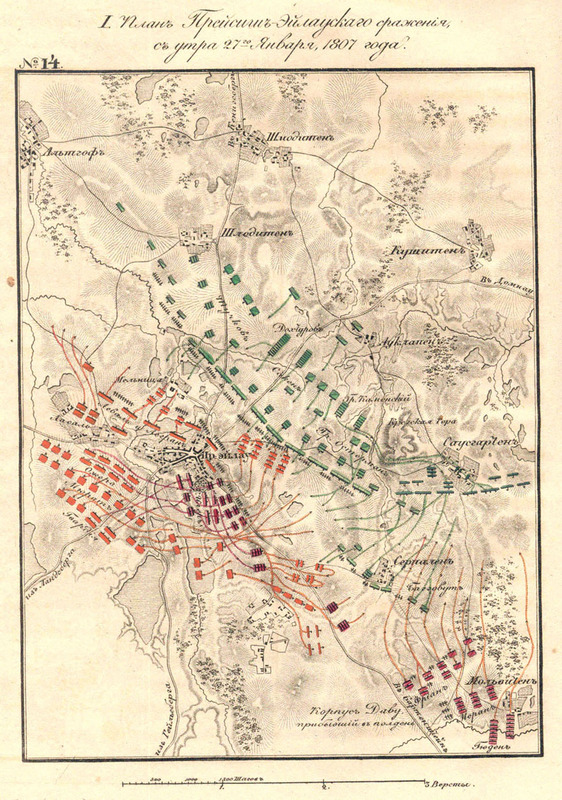 Positions after Frederick the Great’s right flank envelopment maneuver. Click to enlarge. While distracting your opponent (“Greg, look at my thumb!”) you clock your enemy with a roundhouse punch. In military terms, the distraction is called the ‘fixing force’ and the roundhouse punch is, “the enveloping force.” Frederick the Great assigned a small ‘fixing force’ to distract his enemy while the main force traveled behind a hill, hidden from sight. 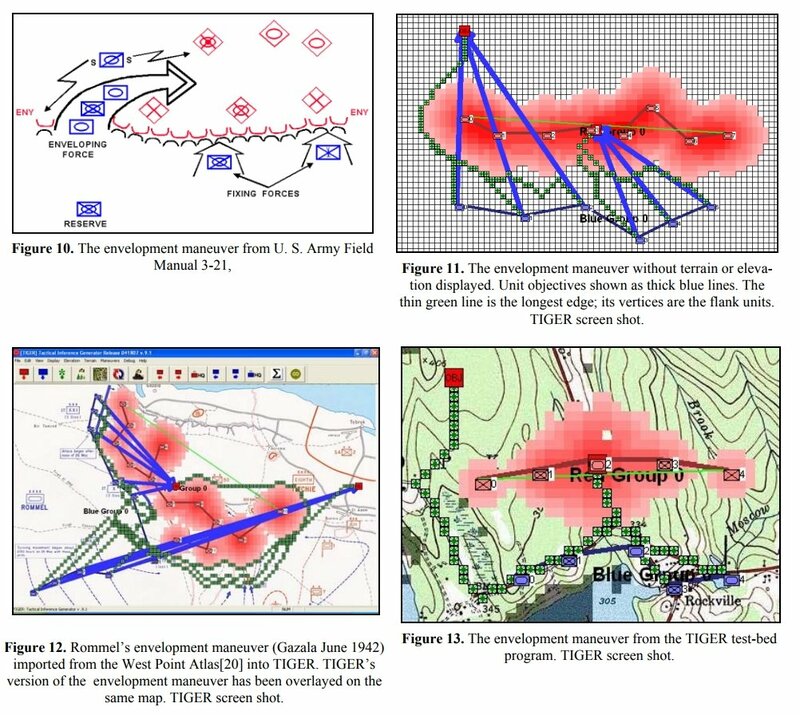 Figures from the author’s, “”Implementing the Five Canonical Offensive Maneuvers in a CGF Environment,” illustrating the TIGER AI’s implementation of the envelopment maneuver. Click to enlarge. The AI is keenly aware of 3D Line of Sight (see here) and will take advantage of intervening terrain (as did Frederick the Great) to hide its maneuvers. You have been warned. This entry was posted in Scenarios and tagged Eylau, Leuthen, Shiloh, U. S. Grant on September 17, 2017 by EzraSidran.